Rackspace Cloud Files / CDN can have access logging enabled on a container, which will log to another container named “.CDN_ACCESS_LOGS” in a folder structure for year/month/date/hour and multiple gzipped log files in each hour folder. This post gives a bash script to do this but on Windows without a bash interpreter or Python etc I wanted an alternative. To review these all in one file, use https://cyberduck.io/ to log in to browse the files, using username and API key. Search for .cdn to expose the hidden access logs folder. Double click to Open it and choose the sub folder you need to review. Right click, Download To, and choose somewhere to save it. Then you’ll have the folder structure on your machine. Search in the folder for *.gz and select all, move to a single folder so they are all in one place. Select all .gz files, right click, 7-Zip, Extract to here. 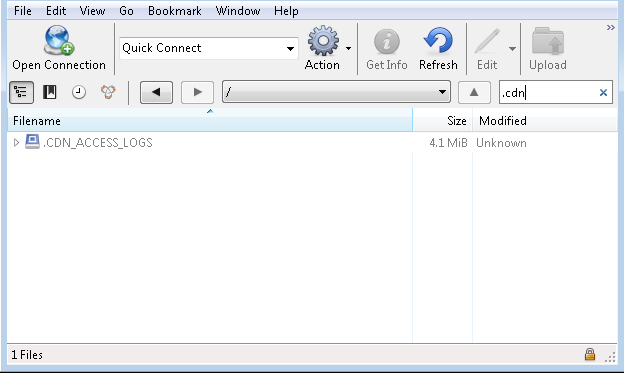 Now you have all the .log files in one folder. Review with your favourite log parsing tool, or to combine into one .log file, open a command prompt to the folder and enter “type *.log > c:\temp\all.log” which will crudely combine them into one file. Not in any order mind.